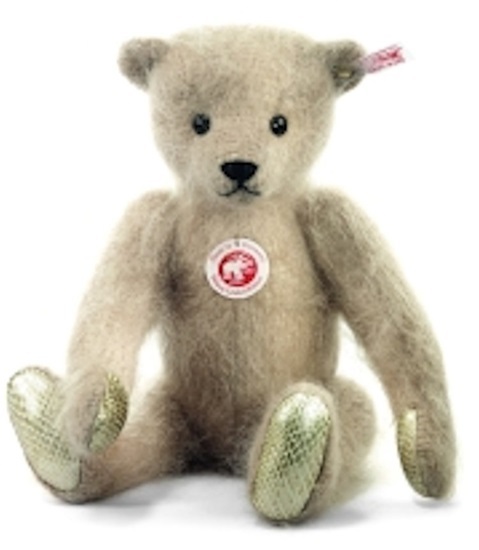 New in 2013 from Steiff's Paradise Jungle Collection, we are pleased to share "Bellamy". This is a 12 1/2" teddy bear that is fully-jointed. "Bellamy" is made up of a very unique mohair. When it came time to create Bellamy, the Steiff designers looked not to their German fabric suppliers, but to England, where they found this very distinctive extra wooly, furry mohair. "Bellamy" is beige-colored, with gold colored paw pads that are made from imitation snakeskin patterned leather. She has black eyes, and a hand-embroidered mouth and nose also in black. She is surface washable and has the white label with the gold-plated button in the ear.